Perfect Queen Sonja. Terrible Martha Louise. The younger girl hasn't combed her hair this morning, didn't her mother notice?. I can't understand. Emma Tallulah had/has a hairproblem. When she was very small her hair stopped growing for a longer period of time. Thankfully her hair grew again, but it seems that it hasn't grown regular on her entire head. This could probably lead to the illusion of unwashed and uncombed hair. Märtha Louise had the same hairproblem when she was a little child and this was the reason why she had short hair in her youth. Caroline8, thanks for your explanation. But it is not only about Emma Tallulah´s hair, her clothes look more like unwashed stable clothes than suitable to go anywhere public. 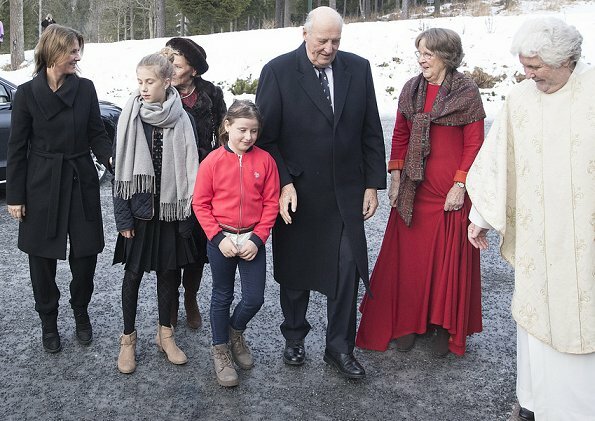 This is not the first time, Märtha Louise does not seem to care at all how much her children embarrass themselves. What says it about people who have to criticise children? That is how "free thinking" modern parents parent. They don't. I was criticizing Märtha Louise. It is her job to see that her kids look appropriate enough. The kids have not enough knowledge of these things, it can not be in their responsibility. They do not understand how many people are looking at these pics. You can try and convince yourself of that, but how would you feel if your own kids read this about themselves. Louise I actually know very well myself how it feels. I am still angry to my mother who did not take care to dress me properly to my confirmation. I had no knowledge how to dress but she of course had. The feeling when you saw the group picture, all other girls have appropriate clothes but you, who stand just in the middle of the photo. I have been very careful after that with my own kids. I would never let them be embarrass the way I was. Martha Louise should have put a little more effort in to dressing for church and made sure her children were dressed appropriately especially when they were accompanying the Queen who looks lovely I might add. Even if the child has a problem with her hair, she could have had it combed in to something that even closely resembled the fact that she put some effort into it. I have read and seen Emma had a huge hairproblem, when she was a little girl and I think she is now so happy/proud of being able to have a ponytail! Don't take that away from her by criticizing. 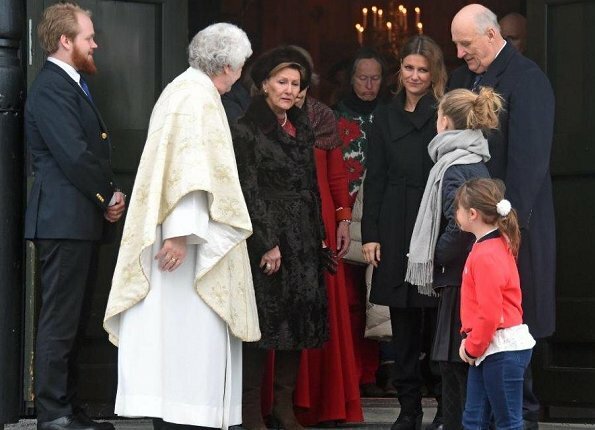 But I agree, Märtha Louise should have given her a nice overcoat on for the Christmas church ceremony. It looks like Norway has had a wonderful white Christmas ! Habt Ihr nichts besseres zu tun als alles zu kritisieren, wie oberflächlich ist das denn? QUEEN Sonja is beautiful and elegant as always. A lovely family. Nice to see the royal princess Martha and 2 of her children.